I was going to make passionfruit / tiramisu type of dessert this weekend. I asked my husband what cheesecake he wanted, he felt like eating just plain cheesecake. 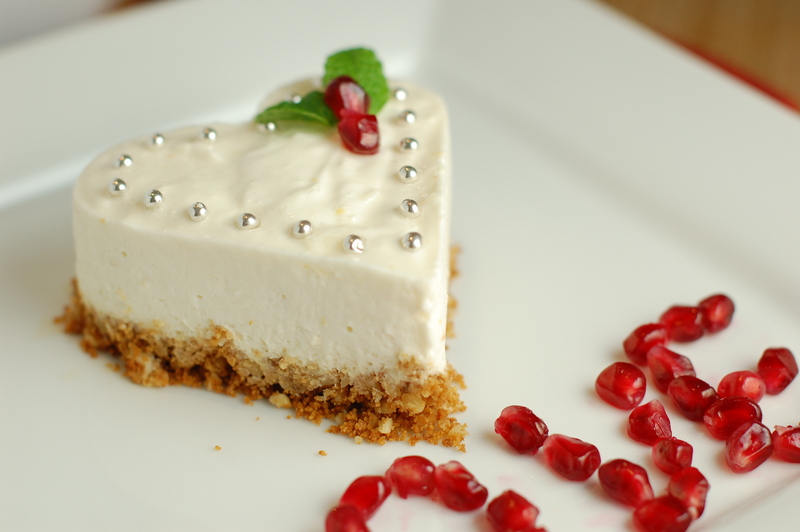 Most plain cheesecake requires baking and using sour cream. I am NOT buying a tub of sour cream and let the rest of the tub sit forgotten. Have to use up whatever I have at home! So I came across a couple recipes of Tofu cheesecake with red bean. I added a lot more cream cheese than in the recipe as I have to finish the cream cheese. The taste is definitely heavier cream cheese than the original tofu flavor. But it’s still gives the smooth texture while not as fattening as the western cheesecake. Prepare the cake base: (I used 1 cup graham crumbs + 1/4 cup of nibbed almond bits + 1/4cup melted butter and pressed into the bottom of the mould, baked for 8 minutes at 350 degrees F). Let cool. Sprinke pinch of salt on the tofu. Boil a pot of water and put the tofu in for 3 minutes. Drain and leave to cool. Cut the cream cheese into small pieces. Blend in the food processor till smoth. Add the tofu, sugar and lemon zest and blend till well mixed. Pour gelatin over water and mix well. Put in microwave for 30 seconds at Power 5. Be close to the microwave to ensure the mixture is not too hot and overflow. The mixture should be fully dissolved. Whip cream till soft peaks. Pour the gelatine solution into the cream cheese mixture. Fold in the whipped cream. Pour into the cake pan. Chill for at least 4 hours. Put some azuki bean on top during serving. Original recipe calls for only 150gm cream cheese, 100 mL heavy cream and 300 gm tofu. Also I decorate with pomegranate seeds for more antioxidant and vitamin C instead of the sweetened azuki beans.